I made this DIY acrylic calendar for organizing my daughter’s room. It turned out really great and I love the results. I thought I would share with y’all how to make your own version. The process is fairly simple but you will need some sort of craft cutter to make things easier. You will need to start by cutting the vinyl with the calendar image. I am going to give you instructions on how to do so with your Silhouette below. Before you get started, download the calendar image using the form below. An email will be sent with instructions for downloading to your computer. 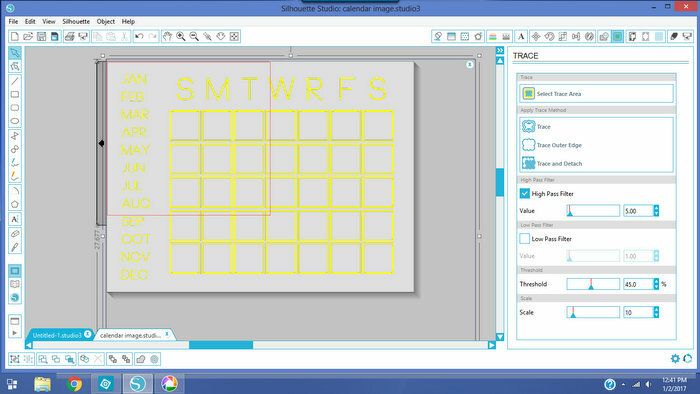 Open that file in your Silhouette software and select the trace option. Click select trace area and highlight the entire image. Move the “high pass filter” bar until everything is yellow. Click trace then delete the original image. You are left with the lines of your calendar. The image fits onto the 18×24 surface so it cannot be cut all at once as it is too large. 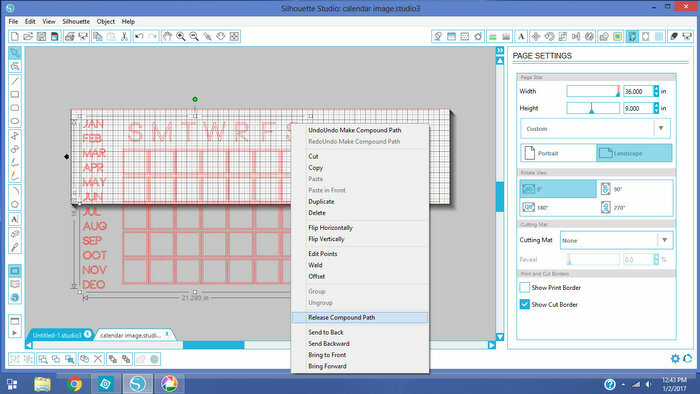 To divide into multiple pieces, right click and then choose release compound path. You can now choose groups of the cut lines and move them around. I cut my calendar in two pieces as shown below. Be careful to ensure that everything stays lined up when moving around the cut lines. Now it is time to put that vinyl onto your plexiglass surface. I made a short video showing you just how I completed this. Watch below! If you can’t watch the video or need further instructions, here is exactly how to make this DIY acrylic calendar. Remove excess around cut vinyl. Use your weeding tool as needed. Be sure to remove centers of letters. Apply transfer tape to pieces and lift off. 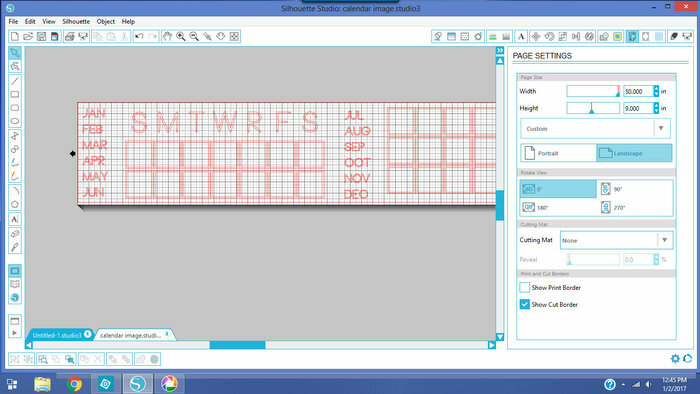 Splice the pieces of your calendar together by joining the pieces of transfer tape. Remove protective film from plexiglass. Press firmly then slowly remove transfer tape. Remove protective film from back of plexiglass. Measure and mark for four holes in the corners. Use a drill and drill bit to slowly drill the holes. 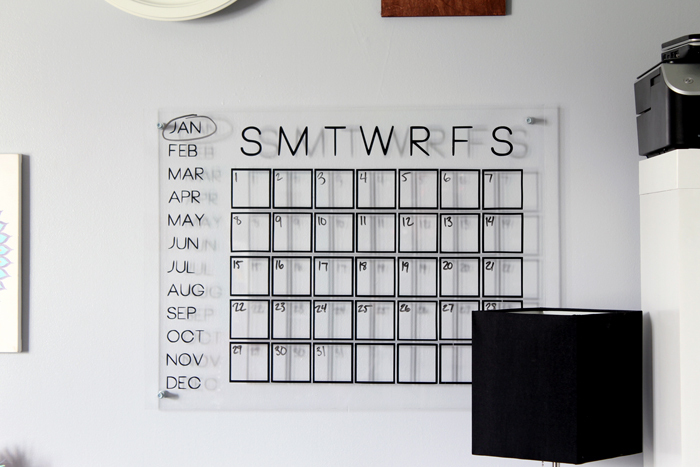 Now it is time to mount your DIY acrylic calendar. I did not want mine flush to the wall so I used metal spacers and washers behind the calendar and put my screw through those and into the wall. This is completely optional but does give a cool effect. Now you can use your dry erase markers to write in the details for the month and keep track of appointments. I just love the final project and I know you will as well. 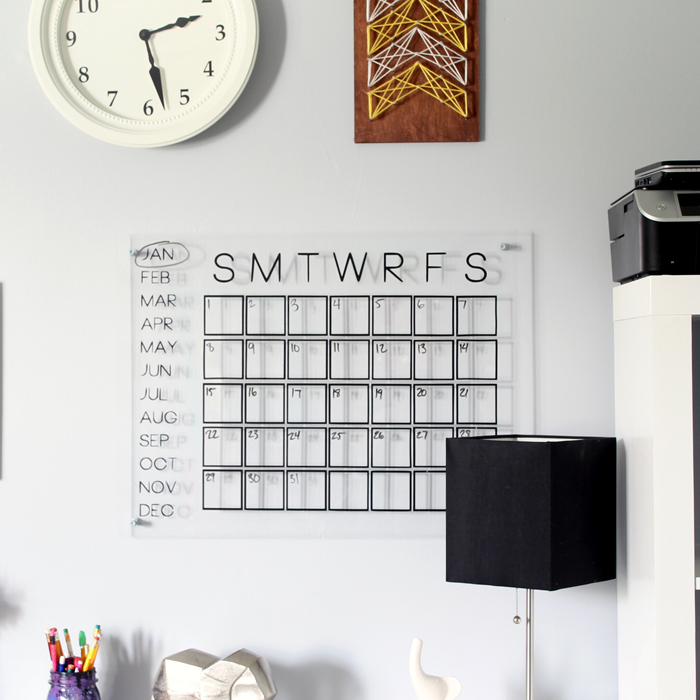 Get your supplies and make your own DIY acrylic calendar. Want more details on this desk space? Stay tuned! I will have a full reveal next week! 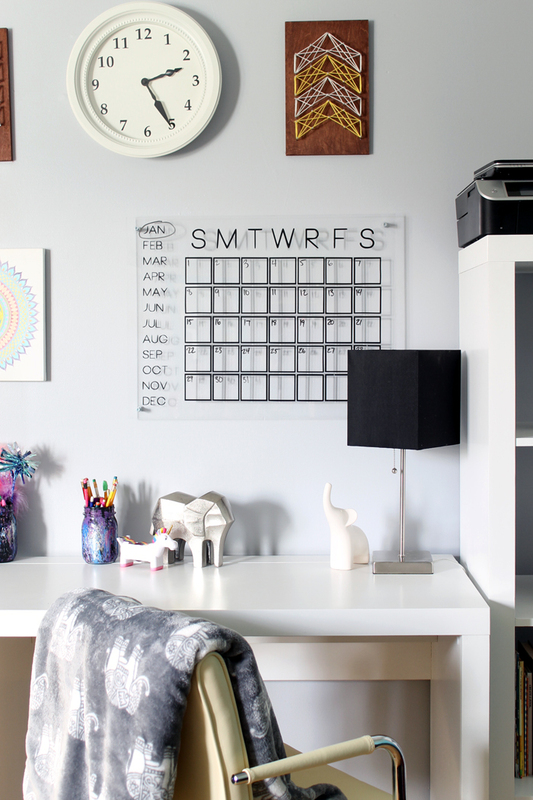 Need more ideas to organize your desk area? We have those for you as well! Love the calendar but I have never seen Thursday represented by an R on a calendar. Have I missed something? That is how I always do it! It can be done either way however. You always abbreviate Thursday with an R? Wondering why? Actually it is a common way to do it. In this case I asked my daughter which one she preferred and went with that since it is in her room. You can definitely change it if you want to make one for yourself! Hello! I’d like to apply the vinyl to on the backside of the plexiglass so I don’t have to wipe over it. Any tips? Maybe printing things from R to L instead of R to L would be easier? You would have to cut it in mirror to do that. You might want to try just a small letter first to see if you are happy with the look. I am not wild about that vinyl on the back side. I would like to know what’s your font ? I think BONNIE but not sure. What is the thickness of the plexiglass? I have to order my plexiglass online. 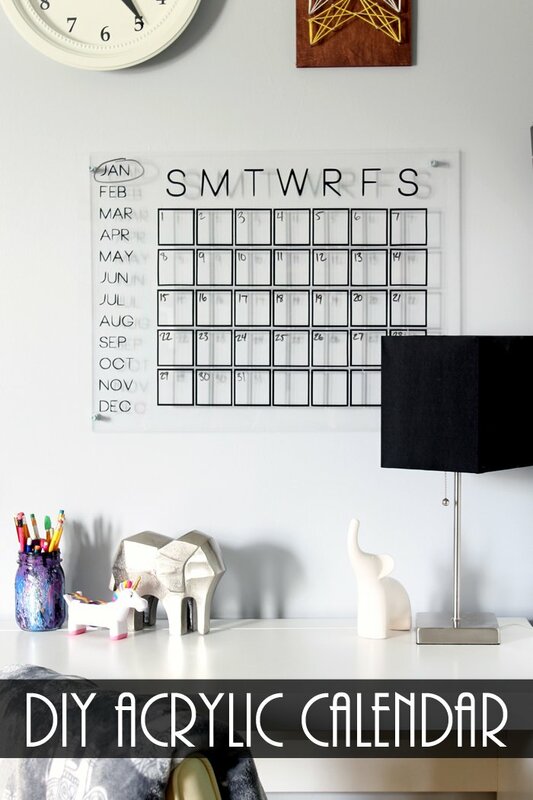 What is the thinnest you would recommend for a calendar that is away from the wall using spacers? Thank you for the video tutorial. how is the vinyl holding up with monthly wiping? I was thinking of doing the back side also so it lasts longer. So far so good and it has been over a year! Love this! Does it go drilled into the wall? If so, is there another way to do it without making holes in the wall? I did four holes that attach it to the wall. You could just put the vinyl right on the wall I guess? Maybe paint the wall with some sort of dry erase paint.